Last August 2013, the Bukit Batikap Monitoring Team found Tarzan and Edwan across the Joloi River. The mighty Tarzan was very healthy and when the Team located him, he was enjoying one of his favourite foods, rattan shoots. Two months later, on October 30 2013, Tarzan was seen along one of our orangutan monitoring transects and the Team were able to observe him for an hour. He was very healthy and also very active. Whilst eating, he kiss-squeaked three times and delivered a longcall in the Teams general direction. His vocalizations were to make the Team aware that he was displeased with their presence and also to give a clear indication of his territory, which shows his natural wild behaviour. However, he then seemed distracted by a new food source he located. Apparently the food was so good that he decided to ignore the Team for once. The next time he was seen was on November 4, 2013 across the headwaters of the Posu River. 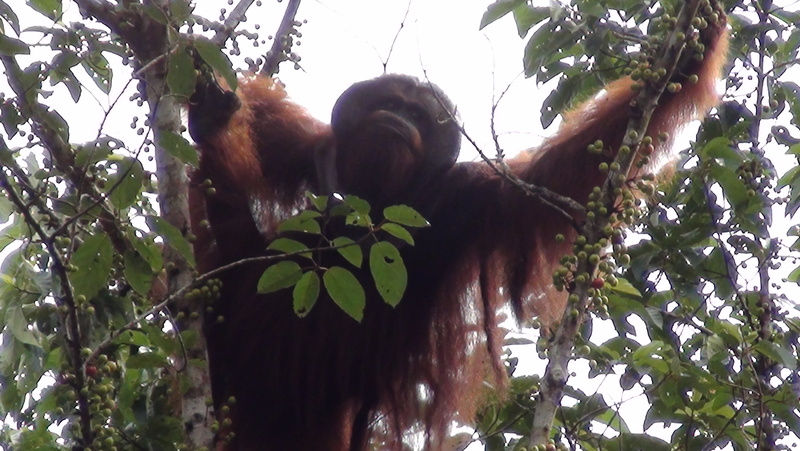 This dominant male who was reintroduced to Bukit Batikap on February 28, 2012, spends most of his time in the trees. That day, Tarzan built his nest early at 14.35. Most probably he was so full from the abundance of fruits he had consumed that day that he felt like resting. Tarzan built his nest 10 m above the ground very quickly and expertly, and soon he was resting comfortably. The next day on November 5, 2013, the Monitoring Team observed Tarzan nest-to-nest to make sure that he was well and also that sufficient data were recorded. When the Team reached the bottom of the tree in which he had nested, Tarzan was still in the nest and looked healthy. He emerged out of the nest and started eating rattan shoots as his breakfast. That day, the Team lost his whereabouts for a short while. Apparently the agile Tarzan had crossed Joloi River through the interconnecting canopy across the river! 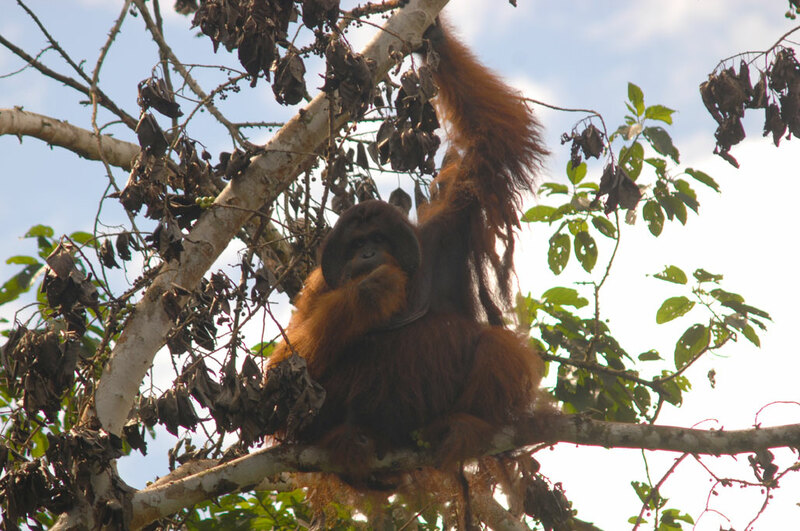 After almost two years of living in the Bukit Batikap Conservation Forest, Tarzan is thriving in natural habitat. He is the dominant male orangutan in the Camp Posu area. From two females who were released together with him two years ago Astrid and Monic, we believe that Tarzan has fathered two young orangutans Astro and Messi. Astro, Astrid’s first child was born in late 2012, while Monic gave birth to Messi in September 2013. During the gestation period for both of these females, Tarzan acted as a very protective guard, and now his two sons have become the most welcomed additions in Bukit Batikap. At 10.45 am, four transport cages carrying Kitty and Kate, Dita and Halt, Zena and William, and Noor arrived at the drop point, Karangan Uban in Batikap. The day before, the Batikap team had traveled to Karangan Uban and spent the night by the Joloi River ready to receive the orangutans. The team had to ensure they were in place beforehand because the release point was far from Camp Totat Jalu and the receding river levels resulted in a longer travel time.. The seven orangutans were then transported to the pre-designated release points, 150 meters across Karang Uban using a ces, a traditional Dayak boat. Kitty was the lucky number one. This made her the 100th orangutan to be reintroduced in Bukit Batikap Conservation Forest by the BOS Foundation- Nyaru Menteng. Meanwhile her daughter Kate was the 101st. Kitty and Kate were released by Dr. Jamartin Sihite, CEO of the BOS Foundation, assisted by Arfan, a Post-Release Monitoring (PRM) technician from Camp Totat Jalu who is originally from Tumbang Tohan Village, a neighbouring village in Bukit Batikap. Once her transport cage door was opened, Kitty climbed a tree with little Kate holding tight onto her. The second cage to be opened was of Dita and Halt’s. They were released by Priadi, also a PRM technician from Camp Totat Jalu. Just like Kitty, Dita who is still caring for her child climbed straight up a tree. But Dita climbed down onto the ground not long after, apparently she was being chased away by a swarm of bees! She and Halt were unharmed, fortunately, and Dita went back up in the trees after the bees were gone. Owang, another PRM technician, opened Zena and William’s travel cage. Zena seemed to hesitate before she stepped out when she saw Dita and Halt run away from the bees. But after Dita climbed the tree again, Zena climbed a tree confidently carrying her son, little William. Meanwhile Noor, the very first orangutan who was received by Nyaru Menteng, was released by Lone D. Nielsen. This beautiful female stared at the team for a while as if she wanted to remember this last moment with her human friends, before she finally climbed into the trees and her true freedom. After releasing the first seven orangutans, the Team went back to Karangan Uban to welcome the next group: Judy and Son, Sarita, Joys, and Hamlet. At 14.41, the orangutans finally arrived. This time, the Team carried the orangutans in their transport cages to their release points, 300 meters away from Karangan Uban. Judy and her son Son were released by Tuek, a PRM technician who is also a local resident from Tumbang Naan village. Judy, carrying Son, climbed a tree right away as soon as the door was opened. The next orangutan, Sarita, was opened by Monica Devi, Adoption Program Coordinator for the BOS Foundation. The beautiful Sarita, who is well known for her love of exploring the pre-release island she was previously placed on, also climbed a tree straight away. Joys was released next by a PRM technician of similar name, Joy! Just like Sarita, Joys confidently climbed a tree as soon as the door was opened. She approached Sarita and the two spent some time together. Joys and Sarita have known each other for a long time since they both lived on Hampapak Island together. Denny Kurniawan, our Program Manager at Nyaru Menteng, released the mighty male Hamlet who couldn’t wait to leave his transport cage. He impatiently stepped out of his transport cage, sitting on top of it with his strong hands grabbing a liana around him. The King of Palas would only move from his position after the Team left him alone. Finally, Jane and Her Family are Home! After successfully releasing 12 orangutans on February 7, some of the Team members returned to Camp Totat Jalu to prepare for the next day of releases, while the rest of the Team stayed at the flying camp (temporary camp) by River Joloi to start the post release monitoring on the newly released orangutans. February 8, at 11.30 am the helicopter arrived at the drop point Karangan Kalaso carrying six transport cages. In those cages were Jupiter and Julfa, Jane and Jiro, Jojang, Mercury, Reno, and Manisha. They all were to be released in Karangan Kalaso. The first cage to be opened was Jupiter and Julfa’s. After Purnomo, a PRM technician opened their cage door and Jupiter, with little Julfa clinging tightly, climbed a tree straight away. Following were Jane and Jiro who were released by Lone D. Nielsen, and Jojang by Nanggau, a technician. After having to delay her homecoming for one year because of her pregnancy with Jiro, Jane was finally home, along with her elder son Jojang and baby Jiro who is now eight months old. Once the door was opened, Jane climbed a tree but she stopped halfway. She stared at Jojang’s transport cage as if waiting for Jojang to step out, but when the door was finally opened, the young boy climbed a tree in a flash ignoring his mother and baby brother. What a son you have there, Jane! But of course Jojang was only behaving like any wild orangutan should. He is very independent and dislikes human’s presence. With the release team in close proximity we expected him to make a sharp exit.. Seeing her son move deep into the forest, Jane and Jiro followed him. Dr. Jamartin Sihite opened the door of Mercury’s travel cage, followed by Reno’s by Tony, a technician from Nyaru Menteng. Both climbed trees right away. Reno descended back to the ground and picked up a decomposed piece of wood to devour termites. Spotting his best friend, Mercury approached. They played and rolled around on the ground, but apparently Reno soon became bored. He didn’t want to play anymore and the playful wrestle turned into a bit of a fight. But it didn’t last long and stopped as soon as Manisha’s cage door was opened by Elldy, a PRM technician from Camp Totat Jalu. Manisha climbed a tree right away. This beauty has known Reno since they both lived on the same pre-release island. Reno suddenly stopped his spat with Mercury and approached Manisha. They played together in the trees before finally engaging in a quick copulation. However, it was not only Reno who was delighted by the presence of Manisha; Mercury was happy too and Manisha didn’t mind being surrounded by her fans. After Reno, she copulated with Mercury and then spent time with him in the trees. Let’s hope we will soon have more babies in Bukit Batikap! The new chapter has started for these three, along with the other 17 orangutans, in Batikap. Manisha has grown into an adult female who is ready to be a mother. The forest survival skills they acquired on the pre-release islands will guide them living their new life as wild orangutans. Enjoy your home! And thank you all for supporting the BOS Foundation to make this happen! Text by: Monica Devi Krisnasari (BOSF Adoption Program Coordinator). Photos by: Monica Devi Krisnasari. After successfully releasing 12 orangutans yesterday, today the BOS Foundation team at Nyaru Menteng continued the orangutan release event by successfully reintroducing eight more orangutans into Bukit Batikap Conservation Forest. Just like yesterday, the Orangutan Release Team at Nyaru Menteng had been preparing since 4.30 am at the Quarantine Enclosure. Vet Maryos V. Tandang, vet Barlian Purnama Putra, and vet Fiet were ready to sedate the orangutans to be released on this second day. Today, the BOS Foundation were going to release eight more orangutans into Bukit Batikap. Unlike the first day when the orangutans were divided into two groups, today there was only going to be one group consisting of Mercury, Manisha, Jupiter and her daughter Julfa, Reno, Jane and both her sons Jojang and Jiro. Mercury was the first to be sedated by vet Barlian and Manisha was the next, sedated by vet Maryos. While waiting for the two orangutans to fall asleep, the Medical Team observed Jupiter. They then decided not to sedate her, who by the way is famous for her habit of holding a leaf between her lips. Technicians and the Medical Team were able to walk Jupiter and her little daughter Julfa into their transport cage. Before going into the cage, Jupiter received a de-worming injection. Meanwhile, vet Barlian was sedating Reno and not far away, Technician Mulyono was also sedating Jojang. Moving on from Reno, vet Barlian then sedated Jane. As always, as soon as the orangutans were asleep, they were moved to their respective transport cage. Manisha started to look a little sleepy and after Medical Team were sure that she was completely asleep, she was moved into her transport cage. The Medical Team had to give Jojang a small top-up dose since the young boy was quite resistant and didn’t fall asleep after the first attempt. In another enclosure, Reno had fallen asleep and the technicians moved him safely to his transport cage. Mother Jane had also fallen asleep, with her small prince Jiro clinging tight onto her. Jiro was born in the Quarantine Enclosure; his mother Jane and older brother Jojang had previously been selected as release candidates and were more than ready for release, until health checks revealed that Jane was pregnant. To ensure both her and her unborn baby’s health, we decided to delay their reintroduction. Now they are strong and ready to go. Before release, the Medical Team had the chance to insert a tiny identification chip into the young boy. Jiro wasn’t too keen and tried to hide behind her Mother’s back. But he was very brave and the quick procedure was over in no time. Jojang was finally asleep so he was able to be moved into his transport cage. Just like Jupiter, Jojang was also given a final de-worming shot. All orangutans were safely in their transport cages, but before they were loaded onto the truck, which would carry them to Tjilik Riwut airport in Palangka Raya, the Medical Team needed to make sure the orangutans had all regained consciousness. Apparently Reno, Jane, and Jojang were still asleep so they were given a reversal to wake them up. When everyone was awake, the truck was then ready to depart for Tjilik Riwut airport, from where the orangutans would then fly to Beringin airport in Muara Teweh. In Muara Teweh, the weather was clear just like yesterday. The nine-strong Muara Teweh team was ready and excited to receive the eight orangutans. For everyone on this team, these orangutans are very dear to their hearts and they have special memories about the orangutans. Technician Suparman who has been with the BOS Foundation Nyaru Menteng team for 11 years talked about how Reno, who was known as the pig in Forest School because he simply ate everything; he has always been one of Suparman’s favourites. Technician Heri Setiawan also commented on how Jupiter was one his favourites. The team has seen all these orangutans grow up, some from a very young age, and throughout their learning process in Nyaru Menteng, and know them all individually. Today, they would say farewell; a happy-sad event. Sad knowing that they would not see the orangutans again, but the happiness and joy were even greater knowing these orangutans would live as they should have been from the very beginning, free in their natural habitat. Back to Palangka Raya, the orangutan truck arrived at the airport at 7.20 in the morning. There was a delay for about one hour before we started the loading process due to foggy weather in Batikap. Once we received news from Batikap that the weather had cleared up, we started the loading process. Reno was the first to be loaded onto the plane. Next was Jojang, Mercury, Manisha, Jupiter and her beautiful daughter Julfa, and lastly, Jane and little Jiro. The loading process took about 15 minutes. After the final checks, at 08.50 they took off for Beringin airport, Muara Teweh. On this flight, vet Barlian and a representative from the Central Kalimantan Conservation and Natural Resources Authority (BKSDA), Pak Wachid, accompanied the orangutans. At 09.30, they arrived at Beringin Airport. Jane and Jiro were the first to be unloaded from the plane, followed by Jupiter and Julfa, Manisha, Mercury, and Reno. The helicopter was already standing by with the cargo net ready. The orangutans in their transport cages were then placed into the cargo net and safely secured. Before the orangutans left for Bukit Batikap, vet Agus Fahroni performed the final checks on the orangutans, making sure they were all safe and comfortable. Soon after, the team saw their beloved orangutans fly back to their true home. Farewell, our dearest orangutans! We will be keeping a close eye on you in the forest as you adapt to your new home. The second day of this orangutan release event has been successfully completed. The Muara Teweh team are traveling back as we write and the Batikap team is coming back to Palangka Raya on February 10. The Batikap team is bringing us news of the orangutans once released and in the forest, so look forward to reading their story and stay tuned! Last but not least, these are the excellent teams we have in Nyaru Menteng and Muara Teweh of whom, along with the Batikap team and your support, their hardwork has made this orangutan release event happen safely and successfully. Thank you, Team BOS Foundation! Text by: Paulina L. Ela (BOSF Communication Specialist). Photos by: Paulina L. Ela, Indrayana, Untung. 20 MORE ORANGUTANS FROM NYARU MENTENG ARE GOING BACK HOME! Despite heavy rainfall in the area surrounding the Quarantine Enclosure in Nyaru Menteng, the orangutan release team was high in spirits, excited to start 2014 the way they ended 2013; releasing more orangutans! The first day of the orangutan releases started with the medical team’s preparation. At 4.15 in the morning the medical team and technicians gathered their equipment from the Nyaru Menteng Clinic and proceeded to the Quarantine Enclosure. It was dark and the rain was still drizzling so preparations for the tranquiliser gun and sedation doses took place under torch light. Vet Agus Fahroni coordinated the vet team who were ready to sedate the orangutans. Before starting the process, the team gathered for the final briefing and group prayer for today’s success. Today, we were going to release 12 orangutans to Bukit Batikap Conservation Forest. They were divided into two groups; the first group consisted of Zena and her son William, Kitty and her daughter Kate, Dita and her daughter Halt, and Noor. While the second group comprised Judy and her son named Son, Hamlet, Joys, and Sarita. Zena, William’s lovely Mother, was the first to be sedated, followed by Dita, Noor, and Kitty; the young ones William, Kate, and Halt didn’t need sedation. Sucessfully sedated, they were carefully carried to their transport cages which had been labeled based on their passengers. Zena finally fell asleep and together with William they were the first to be moved to their transport cage. Meanwhile the effects of sedation started kicking in on Noor and she was immediately moved to her transport cage. Dita had also already fallen asleep by then and was ready to be moved. Her little daughter Halt however, was a little bit nervous when her Mother was about to be moved and ran away from her screaming. The vets and technicians tried to calm the tiny two year old. Dita was moved and tailing closely behind was technician Mulyono who was carrying Halt. The sedation worked a bit slower on Kitty. The Medical Team decided to add to the initial dose. After a while she too was finally asleep and moved to her transport cage with her daughter Kate. Just a moment before the cage door was closed, Kitty was given the anti-sedation (reversal) to wake her up. All transport cages were delivered by truck to Tjilik Riwut airport in Palangka Raya to be flown to Beringin airport in Muara Teweh. Meanwhile in Muara Teweh, the weather was reported clear. The team in Muara Teweh was ready to welcome the 12 orangutans from Palangka Raya. The helicopter was also ready to travel to Beringin airport to meet the orangutans as soon as they arrived. The aircraft which would transport the orangutans had been on standby at Tjilik Riwut airport in Palangka Raya since yesterday. The truck arrived at the airport at 7 in the morning. Soon after, we received the signal to start the loading process. This process took around ten minutes. Then they were ready to fly! 09.10, the Twin Otter airplane arrived in Beringin airport in Muara Teweh bringing its passengers Kitty and Kate, Zena and William, Dita and Halt, Noor, a representative from Cnetral Kalimantan Conservation and Natural Resources Authority, BOSF Advisor Jacqui Sunderland-Groves, Vet Agus Fahroni, and Technician and HLO Abdul Azis. The process of unloading was immediately completed, and the orangutans were checked by Vet Agus and each given milk. The cargo net was ready and the transport cages were positioned and safely wrapped in it. And off to Batikap! Back at the Quarantine Enclosure in Nyaru Menteng, the sedation process had commenced again, and the lucky number one was Hamlet. Sleeping Hamlet was moved to his transport cage immediately. The next one was Judy. Soon she was asleep and moved to her transport cage with her son who is conveniently called Son, holding tightly onto her belly. Handsome little Son looked a bit confused but kept his calm. Next, Sarita was sedated and was soon sleeping peacefully. The team successfully moved her into her transport cage. Joys was the last one. She was a tough cookie and the Medical Team had to add to her sedation dose. After a long while, finally, she fell asleep and was moved into her transport cage. After all the travel cages were loaded onto the truck, the team once again drove to the airport, this time with the second group. They arrived at Tjilik Riwut airport at 10.45 am, and coincided with the arrival of Twin Otter aircraft from Muara Teweh. The loading process took only a short time and soon all the orangutans were safely onboard. They arrived at Beringin airport in Muara Teweh at 11.35 am. The weather was still excellent and the orangutans were unloaded as soon as the aircraft came to a standstill. The orangutans in their transport cages then waited patiently in a shady area next to the waiting room of the airport while waiting for the helicopter. All were given food and milk and continuously checked by Vet Agus and the rest of the team. Soon the B3 helicopter arrived from Batikap. The team did a final check to ensure the safety and comfort of the orangutans during their travel, before loading the cages into the cargo net. It didn’t take long to make sure they were safely secured in the net, and the helicopter once again took off, this time carrying 5 of our beloved orangutans back to freedom. And that’s a wrap for today. We will post a detailed update from Batikap after February 10 when the team in Batikap are back in Palangka Raya. Tomorrow we we have another exciting day of release activities planned so please make sure you follow the amazing journey of our orangutans and our team! Photos by: Paulina L. Ela, Indrayana, Untung, Meryl Yemima. December 1, 2013, the BOS Foundation program in Central Kalimantan at Nyaru Menteng released a mother-daughter pair and one female orangutan to their natural habitat in East Kalimantan. It was the first cross-province orangutan release activity by the BOS Foundation. Now, as part of the effort to meet the target stated in the Indonesian Orangutan Conservation Strategy and Action Plan 2007-2017, the BOS Foundation in Nyaru Menteng releases another 20 orangutans into the Bukit Batikap Conservation Forest. Since early 2012, the BOS Foundation program in Nyaru Menteng has released a total of 99 orangutans into Bukit Batikap. With these 20 orangutans, the BOS Foundation celebrates the 100th orangutan to be released into Bukit Batikap Conservation Forest. Nyaru Menteng, Central Kalimantan, February 7, 2014. On February 7 and 8, 2014, 20 rehabilitant orangutans depart from the BOS Foundation Central Kalimantan Orangutan Reintroduction Program in Nyaru Menteng towards pre-designated release points in the Bukit Batikap Conservation Forest. This group consists of 13 female and seven male orangutans including six mother-infant units. Five of the orangutans to be released Jupiter, Mercury, Reno, Hamlet, and Manisha, were the stars of the Orangutan Island series produced by NHNZ and premiered on Animal Planet. The detailed profiles of all the orangutans being released can be seen in the attached Orangutan Release Candidate Profiles. The 20 orangutans fly from Tjilik Riwut airport in Palangka Raya to Beringin airport in Muara Teweh. From Muara Teweh, they will be transported by a helicopter to the Bukit Batikap Conservation Forest. Due to the number of orangutans, they are divided into two groups. 11 orangutans are flying on the first day, and the rest will fly on the second day. The orangutan release event is part of the effort to meet the target stated in the Indonesian Orangutan Conservation Strategy and Action Plan 2007-2017 which was launched by the President of Indonesia at the Climate Change Conference in Bali 2007. The Plan states that all orangutans within rehabilitation centers should be released by 2015 at the latest. Since 2012, the BOS Foundation has released a total of 120 orangutans to their natural habitat in Central and East Kalimantan, with 99 in Central Kalimantan and 21 orangutans in East Kalimantan. With the 20 orangutans now being released in Central Kalimantan, the BOS Foundation celebrates the 100th orangutan released into Bukit Batikap and in total, they have released 119 orangutans into this conservation forest which is located in Murung Raya Regency. 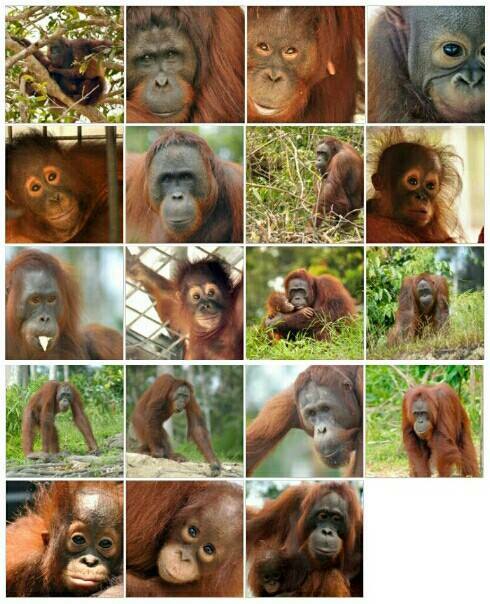 Thus the total orangutans released in both Central and East Kalimantan are 140 orangutans. The success of orangutan conservation efforts heavily relies on the support of many related parties, including the government, community, and private sectors. The BOS Foundation continuously works together with the Government of Indonesia at all levels, this includes the Ministry of Forestry, Central Kalimantan Provincial Government, Murung Raya Regency, and the Central Kalimantan BKSDA. On December 31, 2009, the BOS Foundation and Central Kalimantan Provincial Government signed a cooperation agreement on orangutan and habitat conservation in Central Kalimantan. As an addition to the support from the government, this release event, as always, is also supported by the community of Murung Raya, individual donors, partner organisations, and all concerned conservation organisations all over the world. The BOS Foundation would like to convey its gratitude to BHP Billiton for the financial and logistical support given to undertake this event. The BOS Foundation would also like to reach out to the business community to fulfill their environmental responsibilities to ensure the nature conservation and preservation in Indonesia. On June, 14 2012, Jane finished Forest School and was directly moved onto Kaja Island. She became very adventurous and independent. During her life in Nyaru Menteng, Jane has given birth to two baby boys. Her first son is Jojang who was born on Kaja Island on June 1, 2007 and her youngest son is Jiro, who was born in the Pre-Release Quarantine Area on June 17, 2013. Confiscated from a resident of Palangka Raya, Manisha arrived at Nyaru Menteng on August 12, 2000. She was four years old and weighed only 14.5 kg. The motherless young was also very weak.